Look around you. Well, actually, look up. If you’re inside a modern building, there’s every likelihood that you’re surrounded by heating, ventilation and air conditioning (HVAC) equipment. You might even be in an au courant structure where the HVAC ducting is exposed, lending the space a chic, industrial feel. Whatever the case may be, it’s undeniable that HVAC technology has given rise to the architecture that we work and live in today. But how does all of this ducting and air management come about? Well, architects and drafters have to build these systems into their plans. To help this cadre of comfort providers in their efforts, JTB World introduced an app, HVACPAC, that will run inside AutoCAD 2018. The HVACPAC app was developed using South African HVAC standards, meaning that its standards are similar to most other countries’ standards. 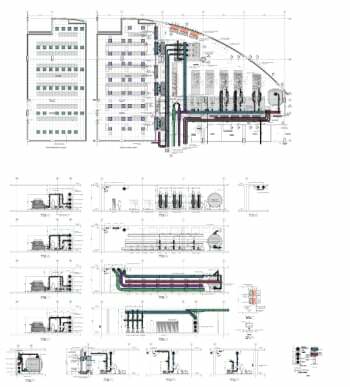 It comes complete with both 2D and 3D tools for developing overhead schematic maps, as well as side-on views for HVAC control rooms and other facilities for maintaining and servicing HVAC hardware. This seems like a pretty cool app, if HVAC is your game. It’s likely to take a lot of hassle out of building your own blocks or programming your own CAD protocols for building these standardized yet immensely complicated and critical pieces of architectural infrastructure. HVACPAC is now available as a 30-day trial from JTB World.